Recently, the photos of kiss scene of Kim Soo Hyun were uploaded onto Internet, the posture of passionate kissing by grasping the neck attracted attention. The first photo is the still of Kim Soo Hyun and Suzy farewell kiss from 2011 KBS drama “Dream High”. In the photo, Kim Soo Hyun sticks his upper body out of the window of the bus, with right hand grabbing the neck of Suzy, interpreting a romantic and desolate parting kiss. 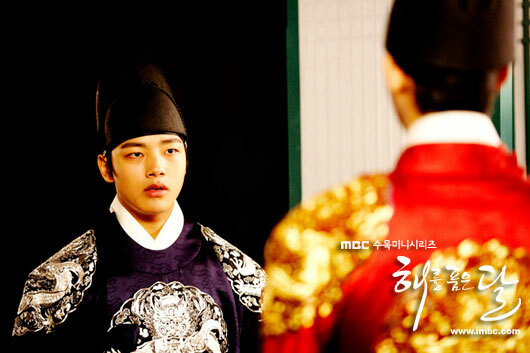 The second photo is the still of Kim Soo Hyun and Han Ga In reunite in 2012 MBC drama “The Moon that Embraces the Sun“. In the photo, Kim Soo Hyun disregards the characteristics of the Joseon Dynasty, using the left hand to grasp the neck of Han Ga In to interpret the romantic and warm reunion kiss. The last photo is the still from the upcoming film “The Thieves”. In the photo, Kim Soo Hyun whose upper body is naked uses his right hand to pull the neck of Jeon Ji Hyun, interpreting a romantic and passionate charming kiss. In all three kiss scenes, Kim Soo Hyun was grabbing the neck of the girls, attracted attention. Netizens commented, ” Kim Soo Hyun is understanding,” “That should be the habit of Kim Soo Hyun,” “Come grab my neck, I will wash my neck and wait,” and so on.